Will Amazon Handmade be the end of Etsy? 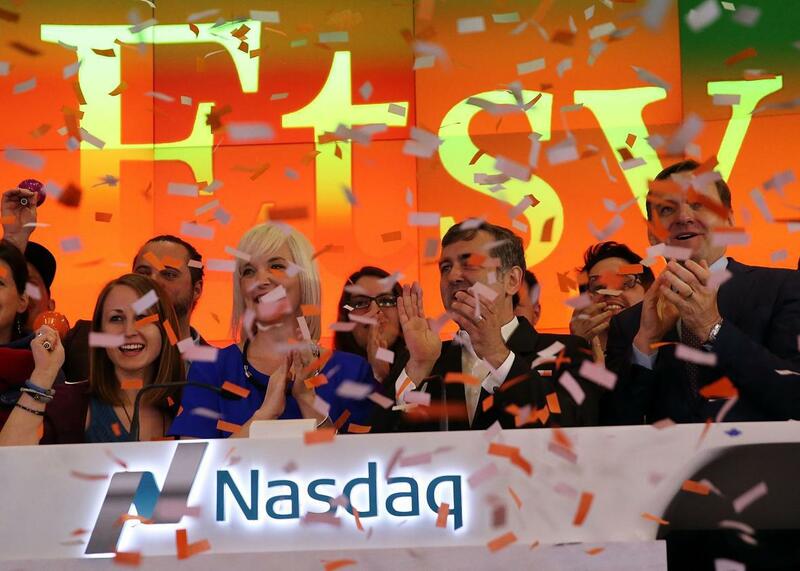 Etsy CEO Chad Dickerson stands with CFO Kristina Salen on the Nasdaq floor as the company went public company on April 16, 2015, in New York City. Seller churn. Etsy sellers in the midranks of Etsy (more than $100 per year of sales to under $10,000 per year) are very interested in the promise of Amazon Handmade, but they remain skeptical of its impact on their shops. It’s a common refrain among Etsy sellers not to “put all your eggs in one basket.” Many look at Amazon Handmade as a hedge against unwelcome changes at Etsy and are at least interested enough to A/B test it for traction, if not abandon ship at Etsy altogether. Brand dilution. Amazon Handmade was an unexpected brand expansion for Amazon (although perhaps not entirely unexpected, once you take into account just how many disparate pies Amazon has its fingers in). Over the past two to three years, Etsy has been accused of undertaking a brand dilution. “Handmade” on Etsy doesn’t exactly mean what it used to. A cursory glance at listings results will show many items that appear to be shipped from the Chinese megamarketplaces Alibaba and AliExpress. Etsy’s lack of enforcement on what “handmade” really is is a bête noire of Etsy’s bread-and-butter seller, the midrange micro-entrepreneur. Etsy has done very little to address this concern. Legal worries. Etsy has been slow to address the large amount of counterfeit goods listed in its marketplace. This gave rise to a recent lawsuit and a precipitous drop in share prices immediately after its initial public offering. Shareholder confidence (or lack thereof). Another, not wholly unexpected, hiccup in Etsy’s slow upward trajectory was the increased scrutiny of its business model, post-IPO. Etsy, like many startups, has never turned a profit. Its listing fees and transaction fees have not changed substantively in the decade-plus since it was launched. Traditionally, shareholders like to see a business pass on earnings for its stocks, although that model has changed somewhat with the advent of huge, non-profitable tech companies, like, yes, Amazon. What does Amazon have to lose? Not much, at first glance. If Amazon really wants to go into a war of attrition with Etsy, there’s no doubt as to who will win. Amazon has nearly 100 times the cash to throw around that Etsy does. It doesn’t matter if the stone hits the pitcher, or the pitcher hits the stone. You know how it’s going to end. Amazon could easily lose interest, though. Its foray into the handmade marketplace might end up feeling a little too much like herding cats, with too little return on investment to keep Amazon’s enthusiasm whetted. Handmade retailers can be curmudgeonly about higher transaction fees and Amazon’s stricter rules about order turnaround. Amazon has already made big changes to its initial offer, which was considered by most Etsy sellers to be too costly to even think about trying. If sellers’ initial foray into the Amazon marketplace doesn’t fill them with confidence, it’s unlikely that Amazon would take extraordinary measures to keep these sellers onboard. Etsy depends on handmade sellers for the bulk of its profits. This is not the case for Amazon. But can Amazon actually kill Etsy? It depends. First, Amazon’s two biggest pull factors for sellers emigrating from Etsy are its strict enforcement of only selling truly handmade goods (something that Etsy, for all practical purposes, stopped enforcing in mid-2013) and a perceived decline in the quality of seller relations on Etsy’s part. Second, it’s unclear whether Amazon’s planned enforcement mechanisms to separate the uncouth chaff from the wheat of truly handmade items will be any more effective than Etsy’s. Etsy has been at this game far longer than Amazon, and it’s entirely possible that Amazon doesn’t know that it’s bitten off more than it can chew. Third, the most important thing is whether the sellers drifting from Etsy to test the waters at Amazon see any overall improvements to their brand reach, traffic, and sales. If they don’t, they won’t bother hanging around Amazon for long. This is not to imply they’ll stay exclusive to Etsy (history tells us they won’t—they’re constantly on the lookout for the magic bullet that Etsy has never provided), but the stability and “friendliness” of Etsy’s marketplace is something that many handmade sellers have come to rely on and expect. If anything, Amazon has a reputation for being extremely unfriendly to its merchants. Amazon’s chances of surviving the next three to five years are extremely good, whether or not they do it with Amazon Handmade as part of their service suite. Etsy is far more on the bubble than Amazon, but it’s not clear whether Amazon’s handmade shop will be the coup de grâce, or whether it would be another of Etsy’s (many) vulnerabilities. The thing is that Amazon Handmade doesn’t even really have to succeed in order to kill Etsy. It could be wholly ephemeral. Amazon could abandon it next year. It hardly matters to the question at hand. Amazon simply needs to be good enough to reveal the existing problems in Etsy’s armor. If Etsy is to survive the next few years, there’s really only two viable options. It can dilute its handmade credo even further and brand itself as a quirkier, more user-friendly version of eBay. To my mind, this would be extremely unwise. The other option is to return to a business model more similar to its pre-2013 approach, where sellers are strictly vetted before market entry but gently cared for thereafter. It’s incredibly hard to imagine how Etsy might begin to roll back some of the changes that alienated sellers, but it’s clear that without the loyalty of sellers, Etsy’s marketplace is not likely to survive. Whether Amazon is what kills Etsy or whether it’s Etsy’s own haphazard strategic planning remains to be seen. Etsy: Why is Etsy struggling to grow? Amazon: How can I make a living selling on Amazon? E-Commerce: What are some tips for starting an Etsy shop?